This model is only one of the over 150 that are avilable to choose from. 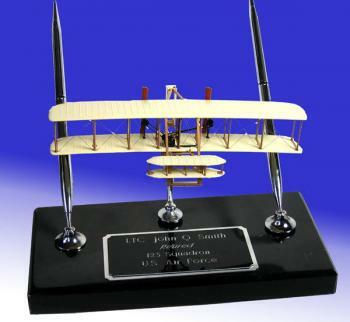 WE have airplane models representing all eras of flight , from the beginning to today. Scales vary from 1:100 to 1:48, the amount of detail in each model will also vary. This is a great gift to give to someone who is changeing Base's ( PCS) or to simply say thanks for a job well done. Keep in mind that our miniature guns will mount on this display just as well as the helmets and airplanes. The airplane shown is a collectors item and will not be available in the near future.